^ Geoffrey Forden, False Alarms on the Nuclear Front. ^ M. S. Longair (2003). Theoretical concepts in physics: an alternative view of theoretical reasoning in physics. Cambridge University Press. p. 377-378. ISBN 9780521528788. http://books.google.com/books?id=bA9Lp2GH6OEC&pg=PA377&dq=rutherford+positive+charge+concentrated+nucleus&lr=&as_drrb_is=q&as_minm_is=0&as_miny_is=&as_maxm_is=0&as_maxy_is=&as_brr=0&ei=fFDNSqPQK6aSkQTMxIDgBw#v=onepage&q=rutherford%20positive%20charge%20concentrated%20nucleus&f=false. ^ Fermi, Enrico (5 1934). Radioactivity Induced by Neutron Bombardment.. pp. 282. http://www.nature.com/nature/journal/v133/n3368/abs/133757a0.html 2009年11月27日閲覧。. ^ O. Hahn and F. Strassmann Über den Nachweis und das Verhalten der bei der Bestrahlung des Urans mittels Neutronen entstehenden Erdalkalimetalle (On the detection and characteristics of the alkaline earth metals formed by irradiation of uranium with neutrons) , Naturwissenschaften Volume 27, Number 1, 11-15 (1939) . The authors were identified as being at the Kaiser-Wilhelm-Institut für Chemie, Berlin-Dahlem. Received 22 December 1938. 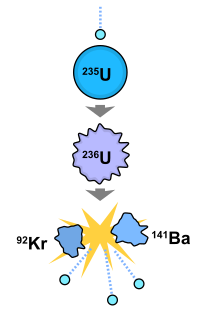 ^ Lise Meitner and O. R. Frisch Disintegration of Uranium by Neutrons: a New Type of Nuclear Reaction, Nature, Volume 143, Number 3615, 239-240 (11 February 1939) . The paper is dated 16 January 1939. Meitner is identified as being at the Physical Institute, Academy of Sciences, Stockholm. Frisch is identified as being at the Institute of Theoretical Physics, University of Copenhagen. ^ O. R. Frisch Physical Evidence for the Division of Heavy Nuclei under Neutron Bombardment, Nature, Volume 143, Number 3616, 276-276 (18 February 1939) . The paper is dated 17 January 1939. 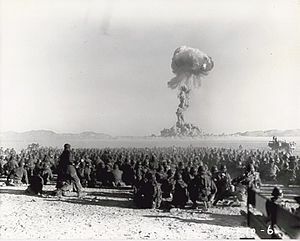 The experiment for this letter to the editor was conducted on 13 January 1939; see Richard Rhodes The Making of the Atomic Bomb 263 and 268 (Simon and Schuster, 1986) . ^ H. L. Anderson, E. T. Booth, J. R. Dunning, E. Fermi, G. N. Glasoe, and F. G. Slack The Fission of Uranium, Phys. Rev. Volume 55, Number 5, 511 - 512 (1939) . Institutional citation: Pupin Physics Laboratories, Columbia University, New York, New York. Received 16 February 1939. ^ a b Drawing uncovered of 'Nazi nuke'. BBC.com. Wednesday, 1 June, 2005, 13:11 GMT 14:11 UK. 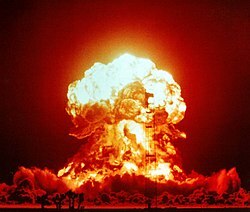 ^ Hitler 'tested small atom bomb'. BBC.com. Monday, 14 March, 2005, 17:33 GMT. ^ "You and I should not now pull on the ends of the rope in which you have tied a knot of war, because the harder you and I pull, the tighter the knot will become. And a time may come when this knot is tied so tight that the person who tied it is no longer capable of untying it, and then the knot will have to be cut. What that would mean I need not explain to you, because you yourself understand perfectly what dreaded forces our two countries possess." ^ 岡崎, 久彦 (1987). 戦略的思考とは何か. p. 100. ISBN 4-12-1007000. ^ Nuclear Weapons - France Nuclear Forces. ^ "Chinese Nuclear Tests Allegedly Cause 750,000 Deaths" Epoch Times. March 30, 2009. .
^ Paul Bracken, The Structure of the Second Nuclear Age, 2003. ^ CNS - South Africa's Nuclear Weapons Program: An Annotated Chronology, 1969-1994. ^ "Ushering in the era of nuclear terrorism," by Patterson, Andrew J. MD, PhD, Critical Care Medicine, v. 35, p.953-954, 2007. ^ Rhys Blakeley, "Terrorists 'have attacked Pakistan nuclear sites three times'," Times Online (August 11, 2009) . David Holloway, Stalin and the Bomb: The Soviet Union and Atomic Energy 1939-1956 (New Haven: Yale University Press, 1995). Richard Rhodes, Dark Sun: The Making of the Hydrogen Bomb (New York: Simon and Schuster, 1995). Richard Rhodes, The Making of the Atomic Bomb (New York: Simon and Schuster, 1986). Mark Walker, German National Socialism and the Quest for Nuclear Power, 1939-1949 (London: Cambridge University Press, 1990). Spencer Weart, Nuclear Fear: A History of Images (Cambridge, MA: Harvard University Press, 1988). Chuck Hansen, U.S. Nuclear Weapons: The Secret History, (Arlington, TX: Aerofax, 1988).